Vital Vox Take 2: A festival of the human voice, supercharged and guaranteed Sandy free! | Will You Miss Me When I'm Gone? Vital Vox Take 2: A festival of the human voice, supercharged and guaranteed Sandy free! Vital Vox was knocked down, but not out, by Superstorm Sandy. If you like the sound of the human voice, but like it even better with a little extra oomph, the Fourth Annual Vital Vox Festival is for you. The two-evening event, as always, features some of today’s most amazing vocal artists. But this year’s twist is called “Vox Electronics” and focuses on amazing artists who take their sound to a new level with electronic manipulation of all kinds. It’s scheduled for Monday and Tuesday, March 25 and 26, at Roulette in Brooklyn. The intriguing festival was scheduled for last October, but a little storm named Sandy had other plans. But organizers have regrouped and are ready to go with a slightly retooled lineup. 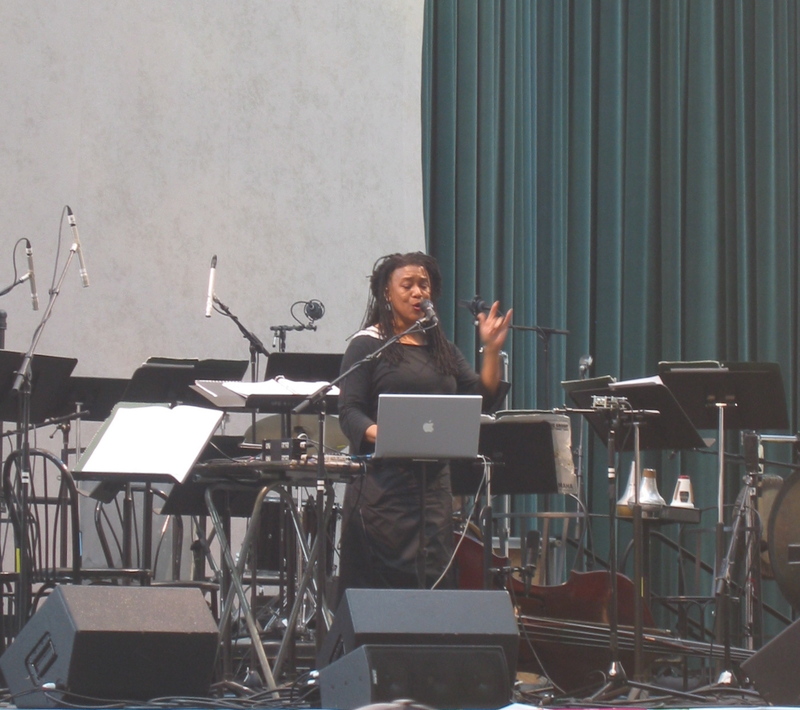 Monday night’s program features Philip Hamilton, Loom Trio (an ensemble that includes Vital Vox co-artistic director Sasha Bogdanowitsch) and violinist-vocalist Sarah Bernstein‘s duo project Unearthish with percussionist Satoshi Takeishi. Tuesday brings in Lisa Karrer and David Simons, Bogdanowitsch with Loom Ensemble and Pamela Z. For our part, Pamela Z was our entree into the world of manipulated voice, and remains among our top two or three favorites in this arena. The things she can do to her voice with a Mac laptop and an occasional piece of percussion is pretty awesome. And when she pulls out her full arsenal — especially her Body Synth gesture controller — look out! The festival’s other co-artistic director, Sabrina Lastman, was scheduled to perform in October, but isn’t on the new program. Every artist on this bill has serious vocal chops. One of them could make your top three. Why not give them a listen? 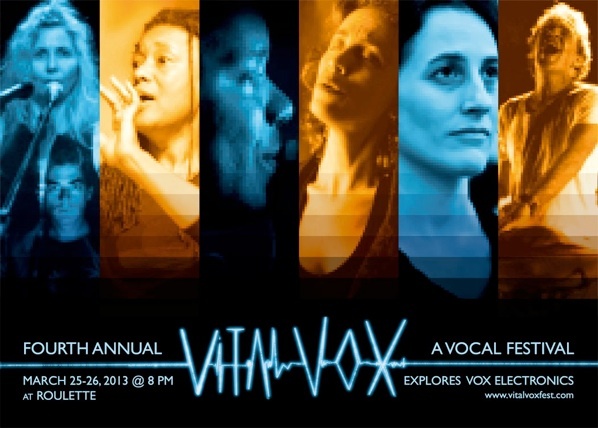 Fourth Annual Vital Vox Festival, 8 p.m. Monday, March 25 and Tuesday, March 26. Roulette, 509 Atlantic Avenue (at Third Avenue), Boerum Hill, Brooklyn. Information at the Vital Vox website or follow Vital Vox on Twitter. Tickets, $15/$10 for students, seniors and members available at the Roulette website. This entry was posted in Concerts, Contemporary, Music, News and tagged Body Synth, David Simons, Lisa Karrer, Lisa Karrer and David Simons, Pamela Z, Philip Hamilton, Roulette, Sabrina Lastman, Sarah Bernstein, Sarah Bernstein with Satoshi Takeishi, Sasha Bogdanowitsch, Satoshi Takeishi, Vital Vox Festival. Bookmark the permalink.